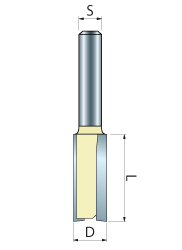 Straight router bits are double flute and carbide tipped. Straight router bits will plane edges, cut grooves, rabbets, slots, and dadoes. They can also be used for mortising and carving, as well as other applications where a flat bottom is required. Cuts all composite materials, plywood, hardwood and softwoods. Please enter key code BIT2 and click Submit. 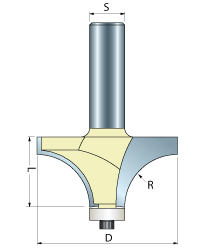 Flush Trim router bits are double flute and carbide tipped with bearing. Use to trim laminate counter tops and good for pattern work. Use this bit to eliminate tear-out problems from routing end or cross grain on very hard woods. Cuts all composite materials, plywood, hardwood and softwoods. Mortising router bits are double flute and carbide tipped for clean cutting of hinges, mortises and dadoes. They can be used with some of the most popular templates. 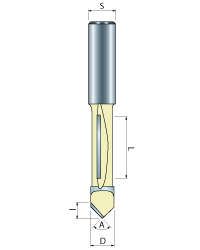 Deep gullet allows maximum material removal. Use for clean mortises in finish work. Cuts all composite materials, plywood, hardwood and softwoods. Plunge Point Panel router bits are good for laying out and cutting openings in paneling, drywall, or siding. 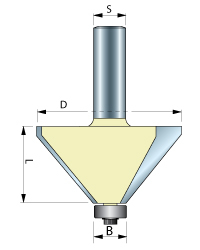 The point plunges smoothly and easily, then the carbide edges cut clean and fast, delivering accurate cuts in less time and with less effort - also great for trimming formica, veneer and other laminates. Rounding Over router bits are double flute and Carbide Tipped with ball bearing guide. Ideal for decorative edges. Cut smooth rounded edges on soft and hardwoods, MDF and other man made sheet goods. Lower the depth setting to produce a decorative bead. Good for softening furniture edges, also used for drop leaf table joints, molding, etc. Plunging Round over router bits are double flute and carbide tipped. For cutting decorative grooves and edge forming. With multiple passes you can cut beautiful moldings and beaded panels. Cuts all composition materials, plywood's, hardwoods, and softwoods. 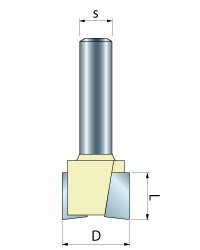 Cove and Bead Groove router bits are double flute and carbide tipped. Produce beautiful decorative grooves in molding and furniture. Use with an edge guide or router table fence to create decorative edge profiles.Cuts all composition materials, plywood's, hardwoods, and softwoods. Use on CNC and other automatic routers as well as hand-held and table-mounted portable routers. 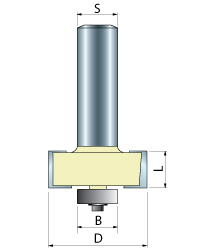 Cove and Bead router bit are double flute and carbide tipped with ball bearing guide. For decorative edges on moldings, tables, mantels, picture frames, cabinets, etc. Also use for panel edging.Cuts all composition materials, plywood's, hardwoods, and softwoods. 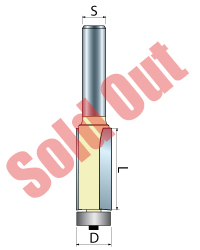 Double Cove and Bead Router Bits are double flute and carbide tipped with Ball bearing guide. Cuts cove with a step or fillet. For decorative edges on moldings, tables, mantels, picture frames, cabinets, etc. Also use for panel edging.Cuts all composition materials, plywood's, hardwoods, and softwoods. 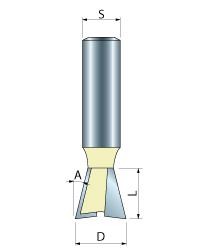 Double Round over router bits are double flute and carbide tipped. These bits provide a different accent edge to drawer fronts, door and table edges, desks, windowsills, chair and handrails, molding, and plaques, etc. Cuts all composition materials, plywood's, hardwoods, and softwoods. 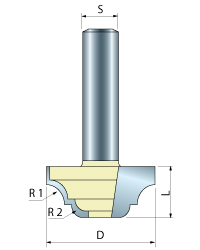 Ogee router bits are double flute and carbide tipped with ball bearing guide. For decorative edges on moldings, tables, mantels, picture frames, cabinets, etc. Also use for panel edging. Classic Roman Ogee router bit are double flute and carbide tipped with ball bearing guides. For decorative edges on moldings, signs, plaques, furniture, etc. Lowering the depth of cut will produce a decorative bead. Cuts all composition materials, plywood's, hardwoods, and softwoods. Dovetail router bits are double flute and carbide tipped. Dovetail joints are mechanically strong as well as decorative. Perfect for making strong joints on drawers, boxes and furniture carcasses. Bits fit most popular jigs. Makes sliding dovetails, half blind dovetails, French dovetails, etc. Cuts all composition materials, plywood's, hardwoods, and softwoods. 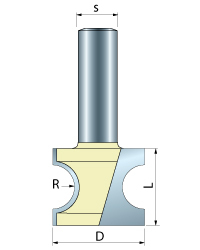 V-Groove router bits are double flute and carbide tipped. Designed to do plunge cuts. 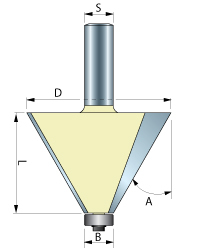 The 90° V-Groove bits are used for cutting full 90° V grooves, 45° chamfers or a 45° angle for an accurate miter. Excellent for sign carving, lettering, grooving, etc. Cuts all composition materials, plywood's, hardwoods, and softwoods. 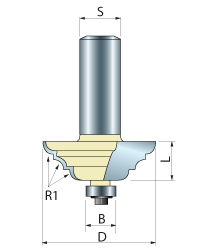 Cove Router Bits are double flute and carbide tipped with ball bearing guides. Ideal for decorative edges. Also used for drop leaf table joints, molding, etc.Cuts all composition materials, plywood's, hardwoods, and softwoods. 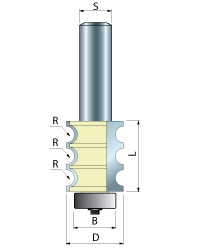 Stepped Cove router bits are double flute and carbide tipped with ball bearing guide. Cuts cove with step or fillet. Ideal for decorative edge designs.Cuts all composition materials, plywood's, hardwoods, and softwood. 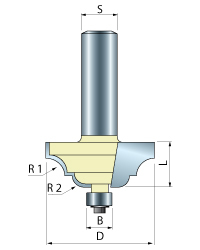 Chamfer router bits are double flute and carbide tipped with ball bearing guide. Use for multiple sided projects , joinery and easy edges. Creates a uniform chamfer on edges of any work piece to add character while retaining crisp geometric lines. Ideal for beveling and decorative edges. Cuts all composition materials, plywood's, hardwoods, and softwoods. 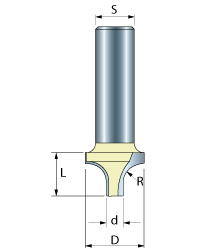 45° Chamfer router bits are double flute and carbide tipped with ball bearing guide. Ideal for beveling and decorative edges. Also used for producing a 45° edge for miters. Use for multiple sided projects , joinery and easy edges .Creates a uniform chamfer on edges of any work piece to add character while retaining crisp geometric lines. Cuts all composition materials, plywood's, hardwoods, and softwoods. 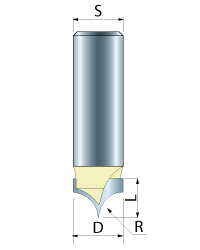 Core Box router bits are double flute and carbide tipped. Will plunge cut. For fluting, reeding, and carving. Cuts a shallow profile.Cuts all composition materials, plywood's, hardwoods, and softwoods. 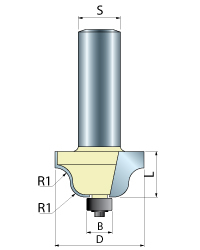 Round Nose router bits are double flute and carbide tipped. Works well in soft or hard woods as well as composition materials. Can be used for reeding, fluting, veining, grooving and general ornamentation where a round bottom groove is desired. 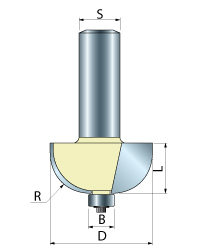 Key Hole router bit are double flute and carbide tipped. 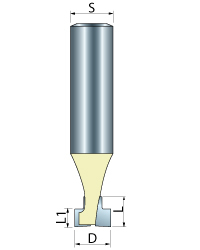 Plunging the bit produces 3/8" hole and moving the router creates a T-slot which will accept the head of a screw or nail. Used for hanging pictures, plaques, clocks, brackets, etc. flush to the wall without additional hardware. 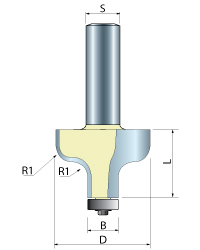 Rabbeting Router Bits are double flute and carbide tipped with ball bearing guide. Use for cutting rabbets, tongue and groove joints and ship lap joints. Cuts all composition materials, plywood's, hardwoods, and softwoods. 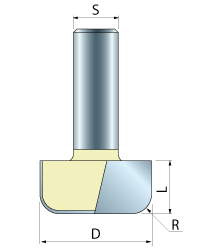 Bullnose router bits are double flute and carbide tipped. 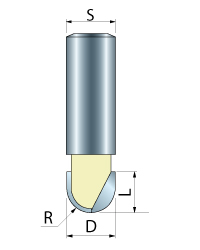 Bull Nose router bits are for half round shapes and edge forming. Can be used to form a completely rounded edge, or to leave a bead on top and/or bottom. Also, with two passes, can make dowels. Cuts all composition materials, plywood's, hardwoods, and softwoods. 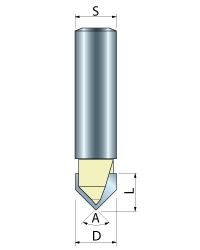 Triple beading router bits are double flute and carbide tipped. These are great for columns, post and decorative moldings. Enhance molding and furniture with multiple beads and fluting. Cuts all composition materials, plywood's, hardwoods, and softwoods. 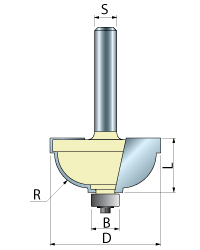 Dish Cutter router bits are double flute and carbide tipped. Cut a straight edge with a 1/4"" radius rounded corner and a flat bottom-all with one bit. Used for routing pockets in serving trays, making coasters, plates, bowls, raised letter signs, etc. Cuts all composition materials, plywood's, hardwoods, and softwoods. 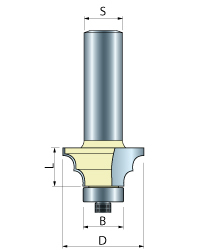 Horizontal Beading router bits are double flute and carbide tipped. Create beautiful wainscoting, paneling, back panels for bookcases and much more. Mills traditional bead board designs. Cuts all composition materials, plywood's, hardwoods, and softwoods. Buy All 66 Router Bits & Save BIG!